Senior wide receiver Tanner Holden finds the endzone for his first touchdown of the season in Wheelersburg’s victory over Heath, 48-0. The Pirates will travel to Columbus once again in week four to face the Bishop Watterson Eagles. The weather decided to wait until halftime in Friday night’s contest between the Wheelersburg Pirates and the Heath Bulldogs. Luckily for the Pirates, the game was far out of reach as the game was called during the intermission as they led 48-0 and improved to 2-1 on the 2018 season. The Pirates first offensive play from scrimmage was a 28 yard touchdown pass from senior first team all-state quarterback, Trent Salyers to co-offensive player of the year in Division V, Tanner Holden. This touchdown was Holden’s first of the season, and he wasn’t quite done leaving his mark on this contest. The Pirates next score came from Evan Horsley who rushed the ball in for a one yard touchdown rush to extend the Pirates lead to 14-0 early in the first half. 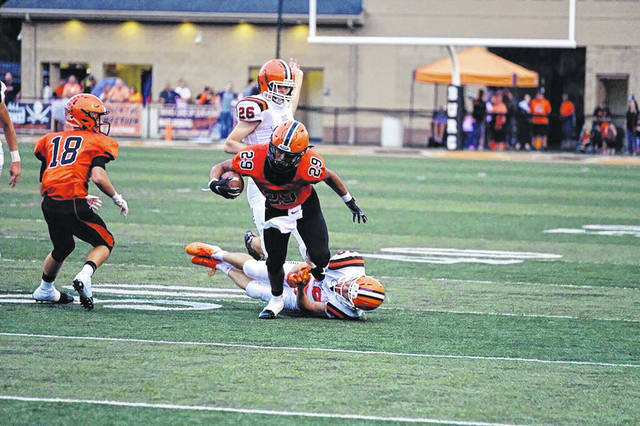 Wheelersburg extended their lead to 28-0 in the second quarter on Evan Horsley’s second rushing touchdown, this one coming from twelve yards out. Horsley finished the night with three carries for 32 yards and two rushing touchdowns. 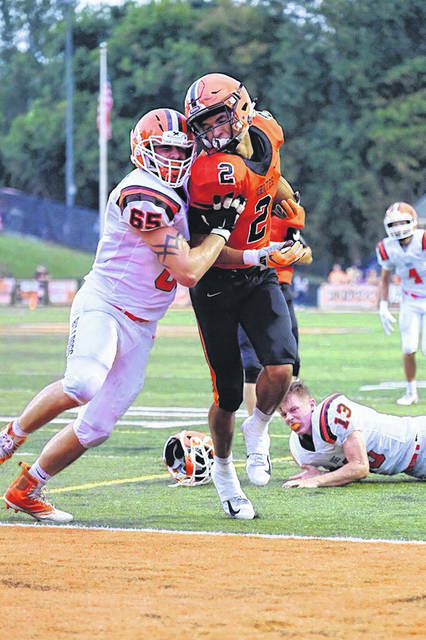 On the Pirates next offensive possession, Salyers ran a QB sneak on the one yard line for his first rushing touchdown of the game, giving Wheelersburg the lead 35-0 with 5:21 left in the half and ultimately the contest. Salyers used his legs in their next offensive series, rushing for the eight yard touchdown rush to once again extend the Pirates lead to 41-0 after Jalen Miller missed his first extra point of the night. Salyers finished the night 9/11 for 106 yards and two touchdowns in the air, while also rushing for 36 yards on five carries and two rushing touchdowns. With 2:25 left in the half and the game, running back Ashton Clevenger, who led the Pirates in rushing with 119 yards, found the endzone on a thirteen yard touchdown rush, finalizing the score at 48-0 after the Jalen Miller made extra point. The Pirates will travel to Columbus once again in week four, this time to face the Bishop Watterson Eagles. Both teams will enter that week four matchup with a record of 2-1.